The 2013 race is scheduled for Sunday, October 13th, 2013 at 4:00pm. The 2012 race was held on Sunday, October 14th at 4:00pm. 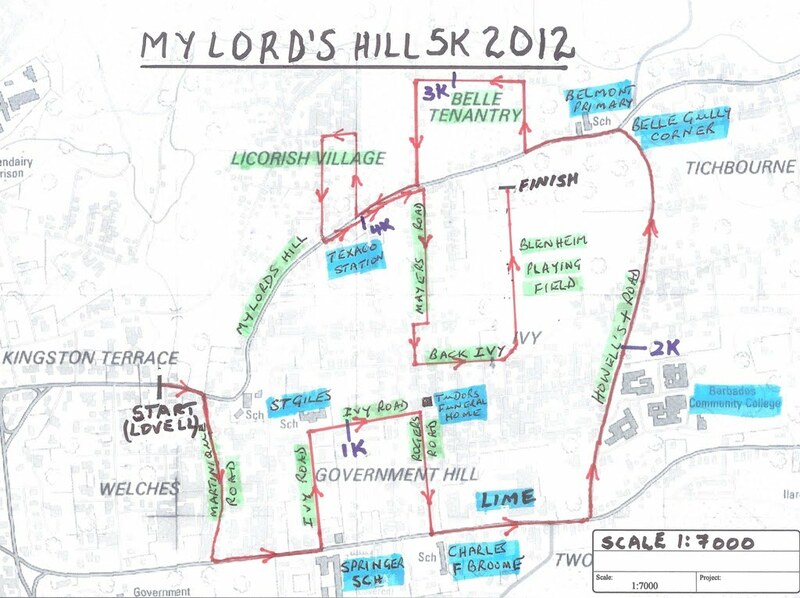 The Race Director of the My Lord’s Hill Community 5K (Mr. David Oxley) said that this year, 2012, he will use the occasion as a tribute to the memory of Anthony Lovell, a former employee of the National Sports Council and the founder of Freedom Striders athletic club. The race will start at the bottom of My Lord’s Hill, in front of the former Shell gas station facility and a mere 20 metres from Mr. Lovell’s former residence, still inhabited by his wife Ainsley. A member of the Lovell family will start the race. Route: Right on to Martinique Road, left on to Government Hill, left at Springer School on to Ivy Road, right on to Rogers Road, left on to Government Hill (passing LIME), left on to Howells + Road (passing Barbados Community College), left on to Highway 4 (at Belle Gully), right on to Belle Tenantry Road, right on to Highway 4, right on to Licorish Village, left on to Highway 4 (passing Texaco gas station), right on to Mayers Road, left on to Back Ivy Road, left on to Blenheim Playing. Finish: National Sports Council Compound (via the playing field). Note that this change in the start location has resulted in an increase in the distance between the start and finish from 300 metres to about one Km. Note too that the start zone has limited parking space. You may also register at the start zone, Lower My Lords Hill between 3:00 & 3:45 on Sunday – race day.